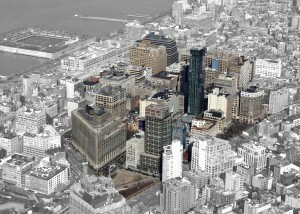 The City Council voted Wednesday to approve the rezoning of Hudson Square in Lower Manhattan. The rezoning will allow developers — including the area’s dominant player Trinity Real Estate — to move forward with several large-scale hotel and residential projects. As part of the approval process, Speaker Christine Quinn secured a commitment for a vote on landmark status for the adjacent South Village Historic District, according to a statement from Greenwich Village Society for Historic Preservation, a preservation group. But community activists were concerned that the city did not discuss any landmark designations for sites south of Houston Street, which is home to nearly half of the proposed district. “The landmarking commitment only covers about half the endangered area and won’t take effect until nine months after the rezoning, allowing developers ample time to knock down historic buildings,” Andrew Berman, executive director of the Greenwich Village group, said in a statement. Posted in Uncategorized and tagged Christine Quinn, Houston Street, Hudson Square, Lower Manhattan, NYC, Re-Zoning, Real Estate, Trinity Real Estate, zoning on April 4, 2013 by NY Living Solutions. Starting next month, a new large-scale tourism campaign will help drive more visitors to Lower Manhattan — spotlighting the area’s remarkable recovery in the nine years since the 9/11 attacks. Announced by Mayor Michael Bloomberg last week, the NYC & Company-designed campaign is launching in anticipation of a major tourism surge downtown — where the 10th anniversary of 9/11 already is drawing scores of visitors to the World Trade Center area. Posted in Uncategorized and tagged 9/11, Lower Manhattan, Michael Bloomberg, NYC Mayor, WTC on June 5, 2011 by NYLS BLOG.